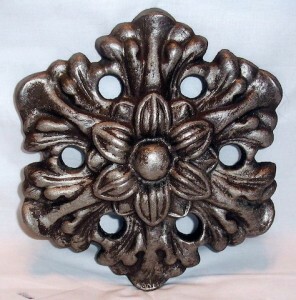 Choosing drapes can be difficult, but choosing drapery medallions can sometimes be even more difficult. Typically, this is due to the enormous range of options available. By taking the time to understand just a few tips, you can make your window treatments both beautiful and functional. Not all drapery hardware is created equal. In fact, some hardware is designed for utility whereas others are meant for decoration. As you can imagine, utility hardware is often less expensive and more basic, mainly because it isn’t seen and is hidden by your drapes or valences. In contrast, decorative options can get expensive and offer more ornate designs and finishes because they are what will be seen when looking at the window. If you’re someone who regularly opens and closes your blinds, you will need a functional medallion that is more likely to be utility hardware. Of course, even windows with functional curtains often have some decorative, stationary elements as well. And when it comes to hanging panels to frame the window, you will need a decorative drapery medallion that will help you make a statement. Depending upon your home and /or personal preferences, you’ll choose a drapery hardware style that suits your needs and likes. Metallic or iron hardware is ideal for contemporary styling, but can also work well in a traditional home setting. It is true that it all comes down to your personal preferences when choosing drapery medallions, but by keeping these guiding factors in mind; it can make the selection process a bit easier. When looking for a variety of options of drapery medallions to choose from, one can always turn to Metropolis Iron for the best selections and expert advice and guidance.